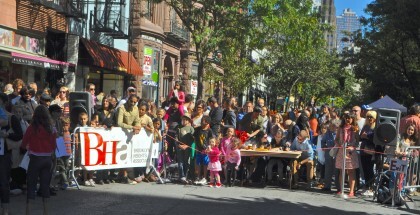 Registration for the Fourth Annual BHA Dog Show, to be held Sunday, September 22 at 3 pm on Montague Street in front of Pets Emporium, is now open. This year the categories include Best Kisser, Cutest Couple or Duo, and Sweetest Big Dog, among others. Entry is free for BHA members and $10 for non-members. Pre-registration is required and will be open until Thursday, September 19th at 6 pm. There’s more info here and on the BHA’s Facebook Page. Photo: Kate Pullen via Flickr. The Brooklyn Bugle is a proud sponsor of this year’s Montague Summer Space. Read more here.